I generally avoid dairy when I can these days, I'm not intolerant but I must admit I feel a lot lighter and leaner when I do. I was lucky enough to hit up the Foundermade wellness conference last month and discovered Brami Beans aka pickled Lupini beans. Awesome as a snack, or even with a cheeky glass of wine. Anyway I got experimenting and ahhh hello creamy pesto!!! I had it with parsnip noodles and shrimp but the options are endless. - Blend all ingredients in a bullet but only 1/2 cup of milk to start. Check consistency. Add more milk and blend again. 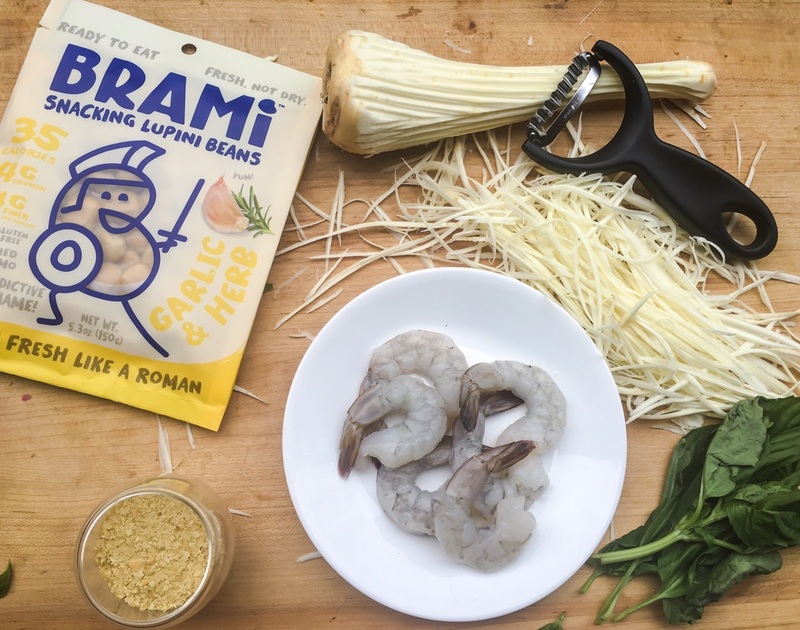 - I made parsnip noodles and cooked with shrimp and garlic but as I said earlier this can be used on anything, even as a stir through sauce at the end of the dish.